As the anode of an OLED, materials with a high work function (WF) have been used to ensure effective hole injection into the organic semiconductor. Transparent conducting oxides, typified by indium tin oxide (ITO), are widely used in bottom-emission or transparent OLEDs. Although the WF of ITO can be up to 5 eV (Mason et al. 1999), a hole injection barrier of about 0.5 eV still exists between the ITO anode and most hole-transporting materials (HTMs) (Lee et al. 1999). In the case of energy-level alignment, where the vacuum level is aligned, the hole injection barrier can be over 0.5 eV, since the ionization energy (IE) of an HTM, typified by N,N′-diphenyl-N,N′-bis(1-naphthyl phenyl)-1,1′-biphenyl-4,4′-diamine (NPB), is about 5.5 eV. Such a large hole injection barrier between the anode and the organic semiconductor exists even on a gold (Au) surface, although the surface WF of a clean Au surface is about 5.4 eV (Wan et al. 2005). To minimize the hole injection barrier from the anode to the HTMs, hole injection materials (HIMs) are often employed. In the 1990s, many small molecules, the IEs of which are smaller than those of HTMs, were mainly used as HIMs for stepwise energy level alignment, examples of which are shown in Fig. 1. For instance, the star arylamines, typified by 4,4′,4″-tris(3-methylphenyl phenylaminotriphenylamine (m-TDATA) and 4,4,4-tris N,N-diphenyl-amino triphenylamine (TDATA) (Shirota et al. 1994; Wang et al. 2008; Shirota and Kageyama 2007), and the phthalocyanines, typified by copper phthalocyanine (CuPc), were generally used (Van Slyke et al. 1996). The IE of these HIMs is about 5 eV, which is smaller than those of typical HTMs (Lee et al. 1999; Shirota et al. 1994) (see Fig. 2). Thus, the device performances were improved by inserting such an HIM between the anode and the HTM. VanSlyke et al. inserted a thin CuPc layer between the anode and the hole-transporting layer (HTL), and achieved a low-voltage and highly stable OLED with optimized thickness (Van Slyke et al. 1996). Wang et al. 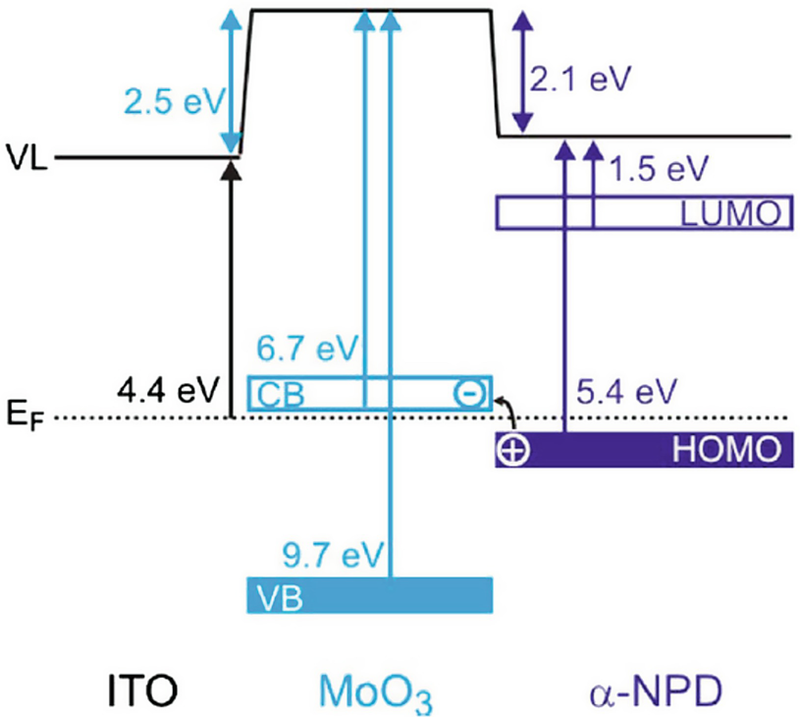 demonstrated that the current efficiency of OLEDs is enhanced by inserting m-TDATA between the ITO and the NPB (Wang et al. 2008). Although driving voltage and efficiency were moderately improved by employing these small molecules, the driving voltage of the OLEDs was not markedly reduced. In the 2000s, small molecules with a strong acceptor property were beginning to be reported as HIMs, the most notable examples being tetrafluoro-tetracyano-quinodimethane (F4-TCNQ) and 2,3,6,7,10,11-hexacyano-1,4,5,8,9,12-hexaazatriphenylene (HAT-CN), as shown in Fig. 3. In the beginning, both the reduction in the driving voltage of OLEDs by F4-TCNQ-doped HTL and the reduction in the hole injection barrier by F4-TCNQ doping were discussed (Pfeiffer et al. 1998; Zhou et al. 2001; Gao and Kahn 2001). Pfeiffer et al. reported that the conductivity and hole injection property of phthalocyanine films are improved by adding a small amount of F4-TCNQ (Pfeiffer et al. 1998). In addition, the reduction in the driving voltage of OLEDs and the improvement of the OLED efficiency were achieved by doping F4-TCNQ into an HIM consisting of TDATA (Zhou et al. 2001). In similar studies, the electronic structure of an F4-TCNQ-doped zinc phthalocyanine (ZnPc) film, which was studied by ultraviolet photoelectron spectroscopy (UPS) and inverse photoemission spectroscopy, was also reported by Gao et al. (Gao and Kahn 2001) In this study, the hole injection barrier between the Au electrode and the ZnPc was studied by UPS with increasing the thickness of a ZnPc film from 0 to 128 Å on a clean Au surface, as shown in Fig. 4. The energy difference between the Fermi level of Au and the highest occupied molecular orbital (HOMO) level of ZnPc, which corresponds to the hole injection barrier, is 0.9 eV. In contrast, the hole injection barrier at the Au/organic layer interface was reduced to 0.18 eV in the F4-TCNQ-doped ZnPc film. The observed significant reduction in the hole injection barrier originates from the efficient charge transfer due to the excellent match between the IE of ZnPc and the electron affinity (EA) of F4-TCNQ, which was detected by inverse photoemission spectroscopy (Gao and Kahn 2003). This charge transfer is defined to be p-type doping in an organic semiconductor and thus the conductivity of the organic semiconductor film can also be improved significantly. Gao et al. also reported that p-type doping is effective for improving the hole injection property and conductivity of an HTM film using NPB, which is a typical HTM (See Fig. 5) (Gao and Kahn 2003). Such p-doped HIMs are widely used in OLEDs not only for reducing the driving voltage but also for improving efficiency and operational stability (Walzer et al. 2007; Lüssem et al. 2013a). The hole injection barrier at the metal/organic layer interface can also be reduced by preparing a thin F4-TCNQ layer on the electrode surface. Koch et al. precisely examined the formation of the interface dipole at Au/F4-TCNQ monolayer interface (Koch et al. 2005). During the formation of an organic layer on the metal surface, the substrate WF of a typical metal generally decreases since the tailing part of the electronic cloud into vacuum is pushed back by repulsion with the electron cloud in the adsorbate (Ishii et al. 1999; Witte et al. 2005). In the case of F4-TCNQ on the metal substrate, on the other hand, F4-TCNQ forms a charge transfer complex on a Au substrate, resulting in the substrate WF becoming larger (Koch et al. 2005) (Fig. 6). 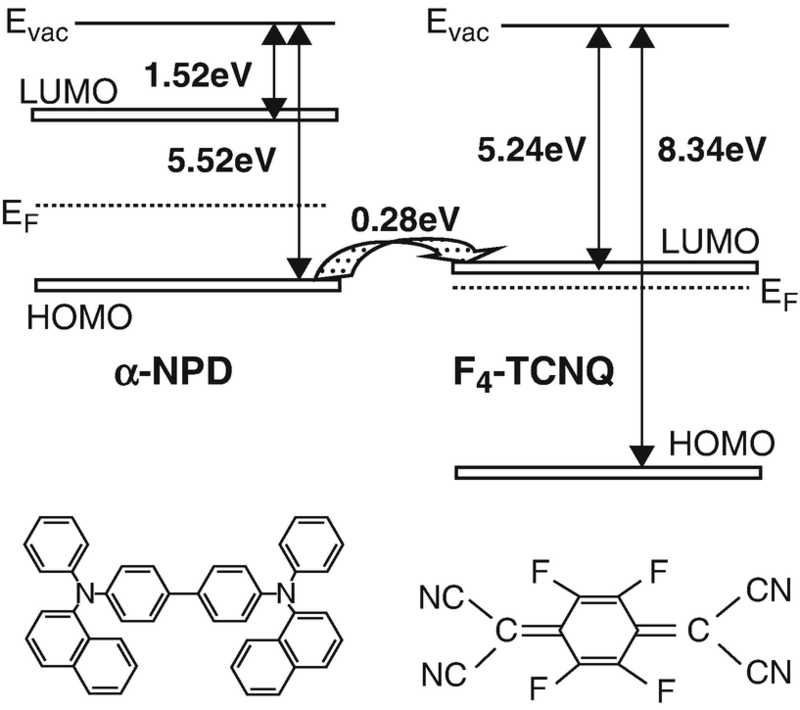 An electric dipole layer with the vacuum side negatively charged was formed by the electron transfer from Au to the adsorbed F4-TCNQ, which was detected by UPS and X-ray photoelectron spectroscopy. The hole injection barrier between the F4-TCNQ-modified Au substrate and the organic layer was much smaller than that between the Au substrate and the organic layer. Similar electronic structures of F4-TCNQ, where the electrons transfer from the substrate to the adsorbed F4-TCNQ, have been reported on several substrates such as other metal electrodes (Rana et al. 2012) and diamond (Qi et al. 2007). Moreover, the interdiffusion of F4-TCNQ was reported by Duhm et al. (2009). 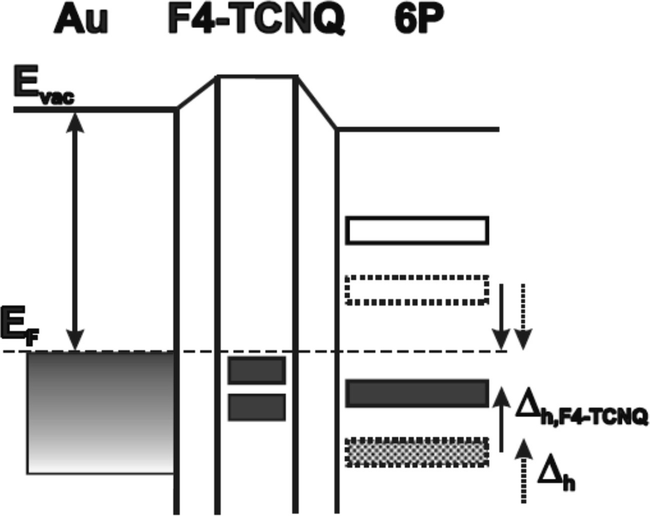 In this study, F4-TCNQ is deposited on pristine layers of TDATA, and then the diffusion of F4-TCNQ toward the Au substrate is detected. 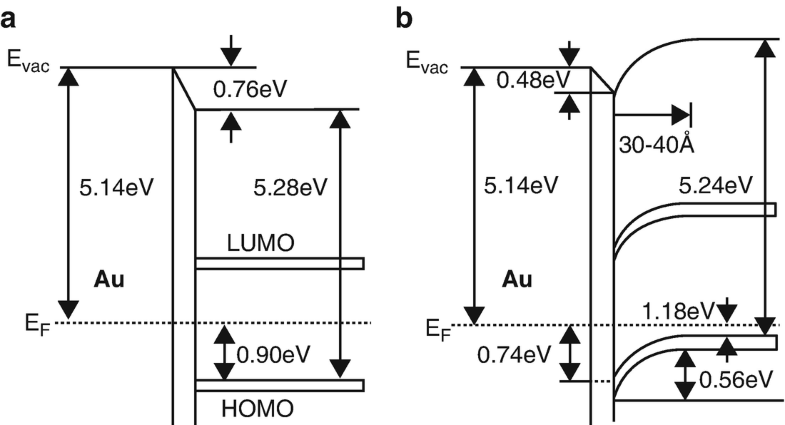 The formation of a charge transfer complex on Au modifies the buried metal surface potential, leading to a realignment of the energy levels of the organic overlayer (Duhm et al. 2009). As discussed earlier, F4-TCNQ is one of the most well-known acceptor materials, and the related phenomena caused by its strong acceptor property have been intensively investigated. More recently, a similar molecule, 1,3,4,5,7,8-hexafluorotetracyanonaphthoquinodimethane (F6-TNAP), the acceptor property of which is stronger than that of F4-TCNQ, has also been reported (Lüssem et al. 2013b). One of the most used acceptor materials in recent years has been HAT-CN, which was reported by LG Chem, Ltd. in 2004 (Son et al. 2004). It is a strongly electron-withdrawing molecule because of its six nitrile groups. Kim et al. reported that the hole injection barrier at the Au/NPB interface is significantly reduced by inserting HAT-CN between the Au substrate and the NPB (Kim et al. 2009) (Fig. 7). While the surface WF of a thick HAT-CN film deposited on Au is about 6.1 eV, it remains a good conducting molecular layer. 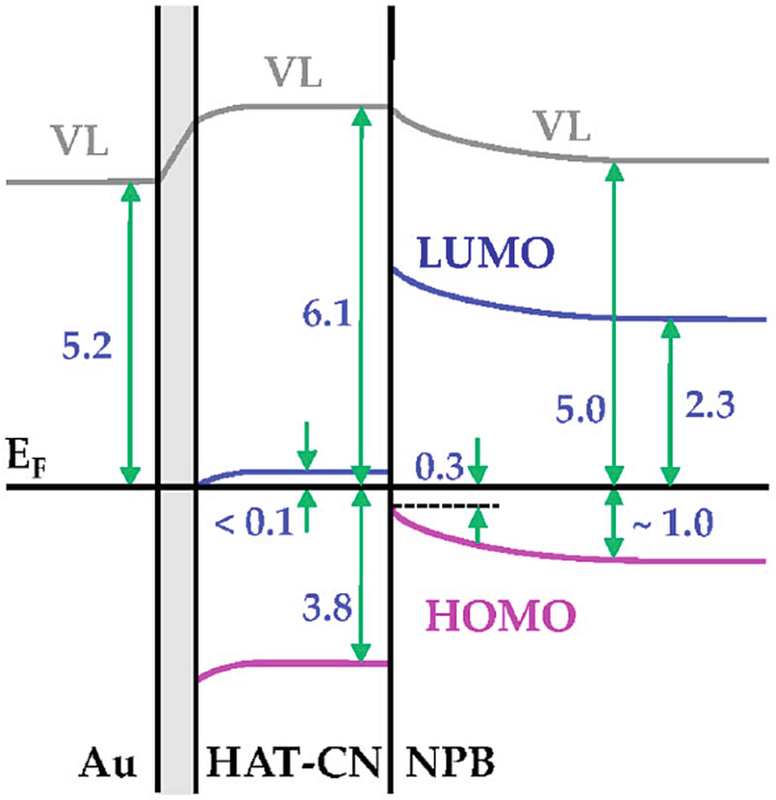 It was found that the lowest unoccupied molecular orbital (LUMO) of HAT-CN is very close to the Fermi level of Au, and the HOMO level of NPB is located only about 0.3 eV below the Fermi level of Au at this molecular interface. It has been suggested that this arrangement allows the electrons from the NPB HOMO to be easily excited to the HAT-CN LUMO, forming a charge carrier generation interface. The reason why HAT-CN is one of the most used acceptor materials is that it is an electrically/chemically stable material. Thus, HAT-CN is used for demonstrating operationally stable OLEDs (Gao et al. 2013). In addition, HAT-CN is used as an HIM in top-emitting inverted OLEDs owing to its relatively high resistance to sputtering (Park et al. 2015). The first reported metal oxide HIMs were vanadium oxide (VOx), molybdenum oxide (MoOx), and ruthenium oxide (RuOx), which were reported by Tokito et al. in 1996 (Tokito et al. 1996). 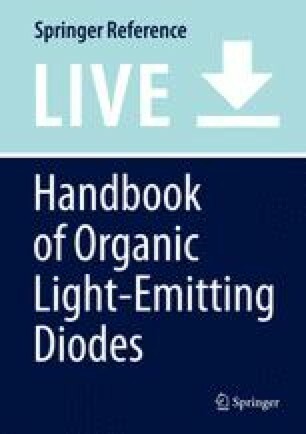 The driving voltages of the OLEDs using metal oxides as HIMs are significantly smaller than those of OLEDs without metal oxides. In particular, MoOx has been widely used up to the present owing to its high hole injection property and relatively low sublimation temperature. In 2006, Morii et al. reported that MoO3 is applicable as an HIM in an inverted OLED consisting of only air-stable materials (Morii et al. 2006). Matsushima et al. reported that a device with a 0.75-nm-thick MoO3 HIM could achieve Ohmic hole injection from the ITO anode to NPB (Matsushima et al. 2007). The Ohmic hole injection was attributed to electron transfer from ITO and NPB to MoO3. In 2009, Kröger et al. reported the detailed electronic structure at ITO/MoO3/NPB interfaces using UPS, as shown in Fig. 8 (Kröger et al. 2009). The observed phenomena were similar to the case of Au/HAT-CN/NPB interfaces. The enhancement of hole injection by inserting MoO3 was concluded to be due to the very high WF and the deep-lying unoccupied states, i.e., the large EA, of the transition metal oxide. Kröger et al. also provided solid experimental evidence for hole injection via electron extraction from the NPB HOMO through the MoO3 conduction band. Nakayama et al. reported the origin of the improved hole-injection efficiency by the deposition of MoO3 on a polymeric semiconductor in an inverted OLED (Nakayama et al. 2009). Although there have been many reports on the hole injection mechanism in a conventional bottom-emitting OLED, little has been discussed regarding the hole injection mechanism and the related electronic structure in an inverted OLED. 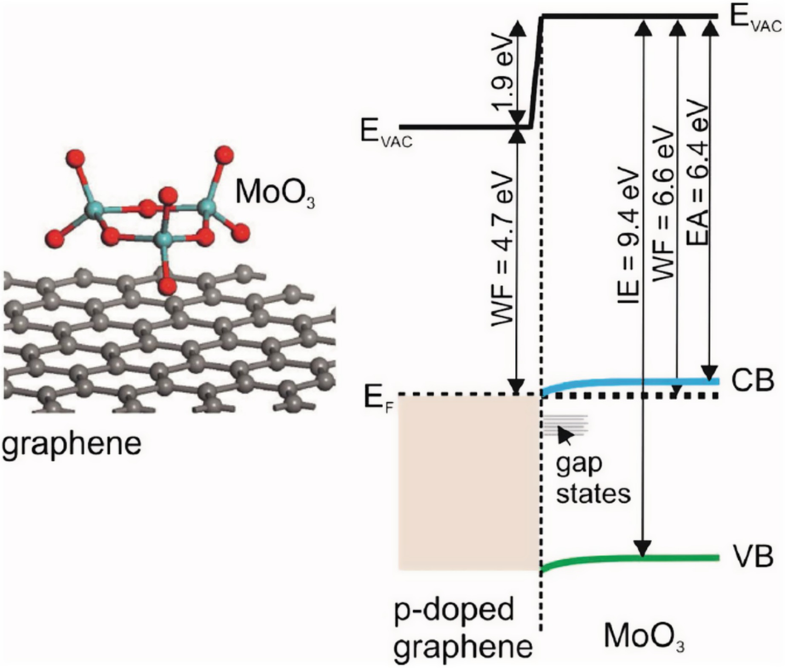 More recently, the enhancement of hole injection from graphene to an HTL has also been demonstrated by inserting MoO3 between a graphene anode and an HTL (Meyer et al. 2014). The surface WF of the graphene/MoO3 surface reaches 6.6 eV, which is caused by the electron transfer from graphene to MoO3 (Fig. 9). In addition to VOx, MoOx, and RuOx, some other metal oxides suitable as HIMs have been reported. In 2002, NiO2 was reported to enhance hole injection from ITO to TPD (Chan et al. 2002). On the other hand, WO3 has been used as an HIM in both conventional and inverted OLEDs (Meyer et al. 2007; Kim et al. 2011). The substrate surface WF can be enlarged by forming halogen derivatives, the electronegativity of that is high, on the surface of the electrode. However, its mechanism is different from that of acceptor molecules such as F4-TCNQ, HAT-CN, and metal oxides. An electric dipole layer with the vacuum side negatively charged is formed by forming halogen derivatives on the surface due to the large electronegativity of halogen derivatives (Campbell et al. 1996). 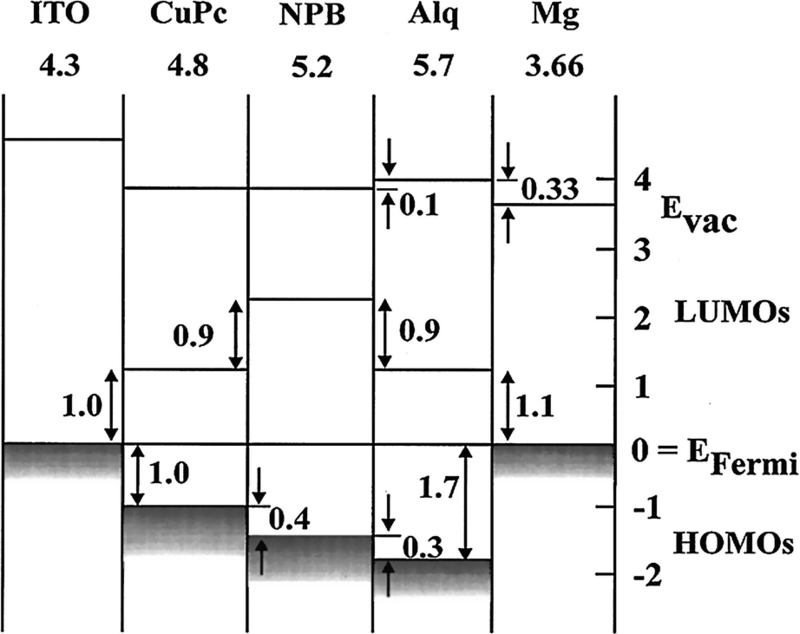 A typical material is a fluorocarbon (CFx) layer formed by the plasma polymerization of CHF3 (Hung et al. 2001). A CFx layer formed on ITO has been widely used since it is effective not only in enhancing hole injection but also in demonstrating operationally stable OLEDs (Tang et al. 2004; Okumoto et al. 2006a, b; Kanno et al. 2007). Some halogen derivatives suitable for forming self-assembled monolayers (SAMs) have also been reported (Choi et al. 2001). In 2011, Helander et al. succeeded in coating the surface of an ITO electrode. The surface WF of Cl-coated ITO is over 6.1 eV (Helander et al. 2011). In summary, low-molecular-weight HIMs are categorized as small molecules, metal oxides, and halogen derivatives. The small molecules, the IEs of which are smaller than those of HTMs, are mainly used for stepwise energy level alignment. On the other hand, the small molecules with a strong acceptor property can not only act as a p-type dopant but also enlarge the surface WF of the anode. The role of the metal oxides is similar to that of the small molecules with a strong acceptor property. Halogen derivatives also enlarge the surface WF of the anode by forming an electric dipole layer with the vacuum side negatively charged.